Floating Bench responds to a gap in the market for contemporary, sustainable, European hardwood garden furniture and can be produced as a 2 or 3 seater bench or as an armchair. It is unique in that the gently curved back rail appears to float unsupported whilst at the same time being robust and comfortable to sit against. 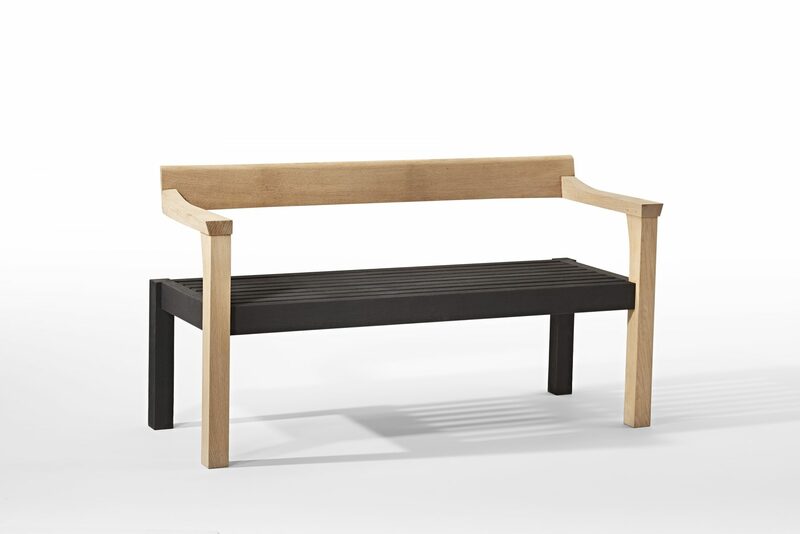 The floating effect is enhanced by the contrast between the dark, scorched seat and the natural oak back and arms. The innovative use of scorching (sometimes called Yaki-Sugi) to colour the seat has the added benefit of providing natural weather protection and since our range was launched at Chelsea 2016 has been adopted by other designers of outdoor timber products. The crisp, sleek lines of the design provide the perfect contrast for natural garden planting whilst effortlessly complimenting more contemporary outdoor spaces with the open back framing a view of the garden.torage.